This Easter Monday marks the "octave day" of the terrible Notre Dame fire, which destroyed the Paris cathedral's 13th-century roof and its 19th-century spire. Thankfully, the Crown of Thorns, Saint. Louis IX’s Robe, and the relic of the True Cross were saved by the firefighters' chaplain, while the altar and the its gold Cross still stand (photo). Reactions to that tragic event have been strongly supportive of the cathedral's reconstruction. The French State (the owner of the cathedral), varied billionaires, and those of much more modest means all seem eager to step up, repair the damage, and restore that great monument of France's historic faith. That is obviously all to the good and something to celebrate. President Macron has committed to rebuilding the great cathedral in five years. Meanwhile, however, Paris is bereft of a functioning cathedral. 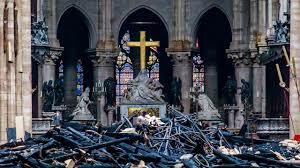 Those who wish to attend Mass at Notre Dame will eventually be able to avail themselves of an "ephemeral cathedral," a wooden substitute church to be built right in front of the damaged cathedral as soon as the site is safe and is reopened to the public.That too is as it should be - because a cathedral, however important it may be as an historical monument (and a tourist attraction) is always first and foremost the seat of the local Church and a sacred place set apart for worship. Until the wooden substitute is constructed, worshipers will obviously have to use other parish churches. Thus the Archbishop of Parish celebrated Holy Thursday morning's Chrism Mass (attended by Madame Macron and some Government Ministers) at Saint-Sulpice, the city's second largest church, and he celebrated Easter Sunday's morning Mass at Saint-Eustache Church on the right bank of the Seine.). I was fortunate to grow up in a city where there was no doubt that the cathedral was the major church. When we went downtown to shop or see the show at Radio City or whatever, we usually made a visit to Saint Patrick's Cathedral. It was just what one did. Cathedrals, of course, are urban structures, and in older European cities are often found at, or close to, the city's center. When Archbishop John Hughes (1797-1864) chose the location for New York's new cathedral in the 1850s, he was criticized and ridiculed for planning to build so far from the city center. More prescient than his critics, Hughes understood the dynamic of urban growth and recognized that the city's imminent expansion would make his chosen site "the heart of the city." When it was dedicated on May 25, 1879, some 7000 people filled all the available space in the not yet fully finished but already grand church. The urban character of cathedrals reflects the historical fact that Christianity developed and expanded in the Roman Empire as an urban religion. It also reflects the religious reality that, just as cities are central gathering places which unite diverse people, Christianity is a gathering religion which assembles communities in central places, united by their common faith in the Risen Christ in a way which transcends their diverse origins. Here too in our church throughout the entire Easter season, along with the Paschal Candle, the ritual reminder of the Risen Christ’s great victory, is displayed is a famous image of the Resurrection, which portrays the Risen Christ standing over the broken gates of hell, lifting up from their coffins Adam and Eve and, through them, the entire human race they symbolize. It is a wonderful image. But, of course, as we all know, no one actually saw the resurrection. Instead, we are told, on the first day of the week. Mary of Magdala came to the tomb early in the morning while it was still dark, and saw the stone removed from the tomb. In the normal course of events, the Sabbath day of rest should have been followed in the morning on the first day of the week by business as usual – both for the living, who would go back to their regular daily work, and even more so for the dead, decaying in their graves, who (then as now) were expected to stay dead. Presumably, those who went to visit Jesus’ tomb also started out with similar expectations. John’s Gospel only mentions Mary Magdalene. The other Gospel writers, however, tell us that Mary was accompanied by other women as well, and that their purpose in visiting the tomb was to anoint Jesus’ dead body. Instead, they found something surprising and unexpected. For that day – and every day since – the world has awakened not to business as usual, but to something totally new. Easter invites us to put ourselves into the picture with Mary Magdalene, and the other women, and then with Peter, and all those disciples unexpectedly experiencing something surprisingly new in a world where everything else seems so ordinary and old. Of all the things that God has ever done, this was the greatest of them all. And so we say today: This is the day the Lord has made! Let us rejoice and be glad! And yet, as we just heard, the first few to be made aware of this momentous news saw nothing but an empty tomb. Which left them maybe more confused than elated: For they did not yet understand the Scripture that he had to rise from the dead. Nor would we, if that were all we had of the story. Jesus’ resurrection was the most important event in all of human history – more important even than the latest presidential tweet or the latest person to leave his or her White House job or the latest candidate to compete for our attention. And yet, however hard it may be for us to imagine in this age of social media and 24-hour news, the world hardly noticed the resurrection at first. In a world which seems permanently stuck in the dark, pre-dawn position, the disciples first needed to experience the kind of change that could come only from the Risen Lord’s living presence among them. And so do we, which is why we are here, where the Risen Lord brings us together as no one else can. Christ is alive! We need to keep reminding ourselves of this, because we can risk seeing Jesus Christ simply as a fine model from the distant past, as a memory... But that would be of no use to us: it would leave us unchanged, it would not set us free. The one who fills us with his grace, the one who liberates us, transforms us, heals and consoles us is someone fully alive. … Alive, he can be present in your life at every moment ... Because he did not only come in the past, but he comes to you today and every day, inviting you to set out towards ever new horizons. And that is why we are here this morning, peering into the open door of the empty tomb, where nothing is anymore as it seemed before. And that is why we have to keep coming back, Sunday after Sunday, year after year, to be filled in on what happened next and thus experience the effects of the resurrection for ourselves. That is why every day for the next seven weeks, the Church retells the story of the early Church in the Acts of the Apostles - the story of those who first experienced the reality of the resurrection and its power to change the world, starting with changing them. Really important things are remembered for their long-term impact, not for the short-term noise they make. Although no one actually saw or heard the resurrection, what we do see and hear are the resurrection’s effects – first of all on the disciples, and then on the world, and finally on us. The resurrection’s effects on the disciples are what we see and hear in the gospel stories of their visits to the empty tomb and then later of the appearances of the risen Lord – and still later in the preaching of Saint Peter and others in the Acts of the Apostles and in the amazing response of those who heard their preaching, and finally in the testimony and letters of Saint Paul, who wasn’t there at all at Easter, but who himself eventually experienced the risen Lord and was forever changed as a result. Its effects on the world were soon evident in the enthusiastic response of Jews and pagans alike to the amazing story the apostles told. In the long term, its effects have been equally dramatic in how the story has spread and the Church has grown as a result, in the dynamism that is at the heart of the Church’s existence in the world and that has propelled it outward in almost 2000 years of world-transforming activity. Finally, its effects are evident in us, transformed in mind and changed in heart, by the unique power of this utterly unexpected event, which has glorified the humanity Jesus shares with each of us, and which has brought us together in a way in which nothing else could have, empowering us not so much with new knowledge as with a new hope. It is the resurrection’s effects which we actually experience and which bring us here today – as Jesus’ body that lived and died and still forever bears the marks of his passion emerges from the tomb to transform our world, starting right here, right now, with us. So it is no wonder we like to ring all the church bells at Easter! How else will the world hear this story? And hear it the world must, for everyone’s sake! To tell the world that Jesus is really alive is the first and most fundamental task we have been entrusted with. That’s what the Church is for – commissioned to preach to the people and testify (as Peter proclaimed in the reading we just heard from the Acts of the Apostles) that Jesus is really risen from the dead and that everyone who believes in him will receive forgiveness of sins through his name. Now the Church obviously isn’t just myself and the deacon here. The Church is all of us. And obviously we are not all the same. Some of us run fast, like the disciple whom Jesus loved. Others, beset by doubts or daily difficulties, run much more slowly, like Peter – Peter, whom Jesus nonetheless chose to be his Church’s principal spokesman. But, whether we are runners or walkers, what matters most, the Gospel story seems to suggest, is that we are here. Whether runners or walkers, we too have come to that tomb that was supposed to stay forever closed and dark, but from which the stone has been removed, in order that we - and the world – may look inside, may see, and believe, and be changed by the experience. Peter's prominence in the post-resurrection appearance accounts highlights how what was happening there continues to happen in the everyday life of the Church, as the Risen Lord continues to reveal himself to his people through the experience we share by baptism as members of the uniquely new community that is the Church, brought into being and animated by the Risen Lord's parting gift of the Holy Spirit. The promises of Holy Baptism, which we will now solemnly renew are our solemn and collective commitment together to keep living this Easter story, to be excited by it, and to stay excited about it, so that the world can experience that something really new has happened - the new life we share with Christ our Risen Lord. Homily for Easter Sunday, Immaculate Conception Church, Knoxville, TN, April 21, 2019. I received from the Lord what I also handed on to you. So begins tonight’s famous reading from Saint Paul’s 1st letter to the Christians in Corinth [1 Corinthians 11:23-26]. Paul’s was the earliest written account of Jesus’ Last Supper with his disciples, a farewell meal that took the place of the Passover feast which Jesus would not live to celebrate and in the process replaced it with something completely new. By convenient coincidence, the calendar corresponds exactly this year, with the Jewish Passover beginning on Friday night just as it did that year. It is safe to suggest that none of Jesus’ disciples, as they sat down to supper with Jesus on that Thursday evening before the Passover holiday, understood that, by the time Passover began 24 hours later, Jesus would be dead and buried, and that they would all be in hiding. And certainly, none of them yet realized how that otherwise ordinary meal would be dramatically transformed forever by Jesus’ death and resurrection into the Church’s central sacrament. The New Testament tells us how, from the very beginning, Christian communities devoted themselves to the breaking of bread and prayers [Acts 2:42]. As the Church grew in size and expanded in influence, the Church’s worship, centered on the regular celebration of the Lord’s Supper, would in time transform, first, the Roman Empire and, then, the ever wider world – as it still must continue to transform each one of us and the wider world we are all a part of. By giving his body and blood to be eaten and drunk, Jesus expressed the deepest truth about what he would do on the Cross, as the true paschal lamb who takes away the sins of the world. The Eucharist we celebrate tonight makes really present that very same body once offered on the Cross, then buried in the tomb, and now risen from the dead and seated at the right hand of the Father. The mystery of the Eucharist, which proclaims the death and resurrection of the Lord until he comes again, is at the very heart of the Church’s life. It is, as we say, the sacrament that makes the Church, which comes into being and receives her unity and mission from the Eucharist [cf. Benedict XVI, Jesus of Nazareth: Holy Week, p. 138]. So, whether amid the splendor of a papal basilica or in the simplicity of a missionary outpost, whether with the Bishop in his cathedral or with friends and neighbors in a local parish church, this same Lord’s Supper has been celebrated generation after generation and treasured by every generation as its precious inheritance – a gift given to us, to experience by living and acting like people who recognize what we have received. The short passage we just heard, however, was originally part of a longer passage that for most of the Church’s history (until just 50 years ago) was what was read at this Mass. This matters because Saint Paul wrote that earliest written account of what happened at that most memorable meal in all of human history not just to tell us a nice story about something that happened a long time ago. It was its present effect that Paul cared most about, and so Paul was in fact complaining, criticizing the Corinthians’ behavior in the present, telling them that they were missing the main point of the Lord’s Supper – receiving the Lord’s Body and Blood in an unworthy way, doing so to their peril. In giving this instruction, Paul wrote, I do not praise you. Your meetings do more harm than good. I hear that when you meet as a church there are divisions among you. When you meet, then, it is not to eat the Lord’s supper. What an indictment! Saint Paul’s more complete account and discussion about the Last Supper was actually a challenge to the Corinthians - as, through them, it is intended to be a challenge now for us. Saint Paul highlighted the Corinthians’ conflicts, dissensions, and factions – in effect, their unfortunate failure to be changed by the Eucharist. Then as now, in 1st-century Corinth among those to whom St. Paul’s account of the Last Supper was originally addressed, all was not well in the Church. The social, economic, and class distinctions, the inequalities, conflicts, dissensions, and factions, endemic in ordinary Roman society were making themselves felt within the Corinthian Church community, so much so that even the celebration of the Lord’s Supper still seemed to mirror those same social, economic, and class distinctions, inequalities, conflicts, dissensions, and factions. But those things that matter so much to us in the secular world, Paul insists, should have absolutely no significance whatever within the community of Christ’s body, in which Jesus’ death and resurrection have not only transformed our individual relationships with him but must also change our relationships with one another. Perhaps the Corinthians couldn’t quite help bringing the world with them - any more than we can, when we come to Mass. That is why what happens here is so important, intended as it is to enable us to leave here different from how we came, to enable us to go beyond our individual self-enclosed limits and so bring something new to the world, something new and different from what we brought here with us from the world. For Jesus’ command to his disciples to do as he did is an invitation to a whole new way of life, made possible for us by what Jesus himself has already done on our behalf. Back at the Last Supper, in the scene that follows next in John’s Gospel [John 13:27-30], Satan is said to have entered Judas, who, then, after taking a morsel of food from Jesus, left the Supper. How many times has Pope Francis warned us about the danger posed by Satan! The Devil, Pope Francis warned just about a year ago, “poisons us with the venom of hatred, desolation, envy, and vice” [Gaudete et Exsultate]. How well might Judas have benefited, had he heeded such a warning! Instead, we are told, he went out into the night – leaving behind Jesus and his disciples, the community that could have been his, in order to commit himself instead to Satan’s cause. What was that morsel of food Judas had received from Jesus? Was it the Eucharist? What a warning there is for us in that! What a reminder of Saint Paul’s warning words to the Corinthians that we will be answerable for the body and blood of the Lord for how we celebrate the Lord’s Supper. So too, for us now, as for Judas at the Lord’s Supper, how we depart from here may matter much more than how we arrive. What have we heard here, and what has happened to us here that has made us different from how we came? What kind of community have we become, thanks to the Lord’s Supper? In the constant competition for our attention and our loyalty, whose cause have we here committed ourselves to? What kind of people are we becoming? What kind of people do we want to become? What will we take with us from here to challenge and change this conflicted and divided world? 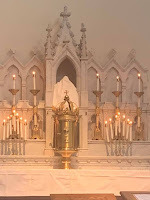 Homily for the Mass of the Lord's Supper, Immaculate Conception Church, Knoxville, TN, April 18, 2019. Since Pope Saint Paul VI's post-conciliar revamping of the Roman calendar, Lent ends this afternoon, and the Easter Triduum commemorating Christ's death, burial, and resurrection begins this evening with the Mass of the Lord's Supper. Previously, Lent lasted until the beginning of the Easter Vigil Mass. Holy Thursday, Good Friday, and Holy Saturday were then called the "Sacred Triduum." Already in 1642, however, Pope Urban VIII had changed the status of this Thursday, Friday, and Saturday from holy days to weekdays, a recognition of the changing character of modern society. While vestiges of popular folk customs continue undoubtedly here and there, the secularization of society and its calendar long ago eroded the impact of these sacred days and their special rituals on many people's ordinary daily lives. Until 1955, therefore, the solemn ceremonies celebrated in the morning on each of these days were sparsely attended - as the reform decree Maxima redemptionis nostrae mysteria acknowledged later that year ("solemnes gravesque has sacri tridui liturgicas actiones a clericis peragi solere, ecclesiarum aulis saepe quasi desertis"). That year's reform, which moved the principal services to the evening on Thursday, the afternoon on Friday, and late evening or night on Saturday, did have the immediate effect of somewhat increasing attendance, at least in the short term. For centuries the observance of these days has seemed to run on two parallel tracks, complementary but definitely different in style and emphasis. The poorly attended but official liturgical ceremonies highlighted the the paschal mystery as a unitary whole. The non-liturgical popular devotions held at more convenient times and typically much better attended, focused more on the historical commemoration and sentimental reenactment of individual events in the Passion story. Some of these popular devotions still survive as a cultural heritage (e.g., Spanish Holy Week processions) and/or as still very valued spiritual exercises of popular piety (e.g., the Stations of the Cross, which in places is still more popular and better attended than the official Liturgy of Good Friday). Meanwhile, the way the official, reformed rites are now celebrated - the times of the services and the replacement often of ancient texts by contemporary sentimental hymns - has significantly highlighted the element of historical commemoration and correspondingly diminished the older, liturgical sense of the unity of the paschal mystery. Thus, for example, the ancient Holy Thursday collect (originally borrowed from elsewhere in the week), with its references to Judas and the "Good Thief," has been replaced by a prayer referencing the Last Supper. Meanwhile the reading from Exodus instructing Moses on the observance of the Passover has been moved from its traditional place on Good Friday (in keeping with the liturgy's emphasis on John's image of Jesus as the paschal lamb) to Thursday, reinforcing the popular, but historically dubious, image of the Last Supper as a Passover "seder." Perhaps it was inevitable that a more popular, vernacular liturgy would take on more of the character and style of some of those more modern, non-liturgical, popular devotions. Humanly speaking, there is something very natural about historical commemoration. It is also obviously the case that, much like the Christmas story, the Passion accounts easily lend themselves to a sort of pious sentimentality that may be inevitable and may in fact be what providentially helps keep the story culturally relevant in our own secularized and sentimental age. In any case, both the liturgical and non-liturgical ceremonies of Holy Week and Easter are all powerful evocations both of the momentous events surrounding the death and resurrection of Jesus and of their salvific significance for us. It is a very special time, when, like Mary of Bethany (cf. John 12:1-11), the Church employs all her varied ritual treasures - and invites and encourages all of us to take maximum advantage of what she offers. Begun in 1160, it was basically completed by the mid-13th century and has long been recognized as one of the great Gothic masterpieces. It has been inseparably linked with the identity and history of France, "the eldest daughter of the Church." The trials and tribulations of the French Church have been hers. In 1548, Huguenots destroyed some statues. It was more thoroughly desecrated by the French Revolution, which rededicated it to "Reason" in 1793 and then turned it into a warehouse. Napoleon restored its religious, Catholic character and then in 1804 crowned himself Emperor there. General Charles De Gaulle attended a triumphant Te Deum there on August 26, 1944, to give thanks for the liberation of Paris from the Germans (even while sporadic gun shots rang out, both outside and within the great cathedral). It is no accident that distances within France are marked from kilometre zéro at Notre Dame. Last night's fire was yet another tragic blow to that sacred place, as well as an incalculable blow to our Western cultural heritage. Our post-modern, secular society aptly expresses its spiritual emptiness and its inhuman ugliness in its soul-destroying inhumane ugly buildings, reflecting the diminished character of contemporary human aspiration. The age of the great cathedrals was limited and imperfect in many ways, but at least it directed human hearts and minds to look upward as opposed to our contemporary preoccupation primarily with our petty selves. 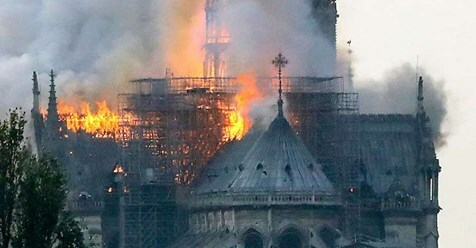 Although the monumental (19th-century) wooden spire completely collapsed, fortunately the familiar bell towers and much of the fabric have survived, a true tribute to the inherent wisdom in gothic architecture. Also the relic of the Crown of Thorns has been saved. There is still a church, however damaged, on that historic site. And, God willing, the world will somehow bestir itself to rebuild this treasure of our past and of our hopes for the future. Almost 50 years ago, in August 1969, I visited a church for Mass. While waiting I read something I picked up in the pamphlet rack in the vestibule. It was an article about the new liturgy, full of radical suggestions. One proposal was that the Palm Sunday procession should be abolished because it obviously made no sense to modern people, who after all don't do such things. To me it seemed rather that it was the author that was obviously out of touch with popular sentiment, because, of course, that very week thousands of people had turned out for a ticker-tape parade to honor the Apollo 11 Astronauts who had landed on the moon the month before. Not quite another ticker-tape parade, but, roughly half-way between then and now, when I was studying in Israel in 1993, I visited a village in Samaria for the 1st Mass of a newly ordained local priest. Everyone gathered at the village boundary, around an arch of palm branches and balloons, waiting there for the new priest to enter his hometown. As the procession began and all the villagers started shouting and waving palms in the air, my host said to me: now you see what Palm Sunday looked like! The rest of the story [Luke 22:14-23:56], which we have just heard, reveals the ultimate destination of that journey – to the cross and the tomb. We, of course, are the prime beneficiaries of this. It all happened, as we say every Sunday in the Creed, for us and for our salvation. So it is no accident that the cross in the central symbol of Christianity, because the cross of Jesus is precisely where we meet God in our world, just as the tomb – the eventually empty tomb – shows us where he is taking us. In a world where oppression and injustice, and suffering and death always seem to have the last word, the Passion of Jesus was God’s great act of solidarity with us and our world, as well as an example of how to respond. For every word Jesus utters in his passion shows him reaching out to others – to the women of Jerusalem, to his executioners, to the convict being executed along with him – finally commending himself once and for all to his Father. - because, thanks to Jesus’ cross, oppression and injustice, and suffering and death no longer have the last word in our world. Homily for Palm Sunday, Immaculate Conception Church, Knoxville, TN, April 14, 2019. Aristotle, who was right more often than he was wrong, appreciated that practical wisdom depends significantly upon experience, which would argue against our contemporary obsession with youth (cf. Nichomachean Ethics, Book 6, Chapter 8, 1142a). As a general rule, at least in normal times, that would certainly seem to be true. Even in a time of crisis, it is likely to be true. In his admirable new biography, Churchill : Walking with Destiny (Viking 2018), Andrew Roberts emphasizes how Churchill's whole life, the offices he had held, the unique experiences he had had, all prepared him for the unprecedented challenge he faced in 1940, "fortified by sixty-five years of conscious or unconscious preparation." Not all crises are the same, however, and some crises - such as the one we are experiencing in contemporary Western democracies - may sometimes challenge that conventional paradigm, by highlighting the fundamental failure of the presently empowered political class and hence inviting voters to look elsewhere when electing new leaders. Even if Churchill may indeed have been superbly prepared to assume the Prime Ministership in 1940, it was in fact only the catastrophic failure of the British political Establishment that created the crisis which made Churchill's appointment possible. Without excessively exaggerating the historical parallel, it is evident that we are again at a similar moment when it comes to selecting suitable leaders, having been so ill served by the presently empowered political class. Hence the surprising plausibility of one of the youngest candidates ever to propose himself for the presidency. I refer, of course, to "Mayor Pete," South Bend's 37-year old Mayor Peter Buttigieg, who is not only the youngest candidate to enter the presidential race so far but also the most overtly religious (or at least the one most comfortable talking in religious terms). And Buttugieg can claim more military experience than almost all the other candidates. When I was growing up, such experience was, of course, the norm. Not only is military service inherently desirable in someone who proposes him or herself as a national leader, it also offers perspective. Military service typically introduces a future leader to other citizens from backgrounds other than his or her own. It also exposes one to real enemies, which ought to provide perspective and so make it harder to treat as enemies fellow citizens with whom one simply disagrees. Add to his executive and military experience his elite education, and "Mayor Pete" more than meets the minimum threshold of preparation for serious consideration of his possible candidacy - in a way which, while conventionally reassuring, allows him to retain the outsider edge that heightens his appeal. It frees him to highlight the fact that he comes from the next generation in line, a generation uniquely positioned to present a different perspective on the accumulated mess his generation has been forced to inherit from the presently empowered political class. Only time and the bizarre process by which we pick our presidents will determine whether Buttigieg personally has what it takes to be a serious candidate. The fact that he has made such a strong initial impression, however, highlights the evident desire of many for someone different from the established and predictable. Of particular interest in terms of his newness is his ability and willingness to engage from an explicitly religious perspective, in the process exposing the scandalous hypocrisy of so much of the American religious establishment. Back in 2016, it was Southern Baptist Russell Moore who famously diagnosed that scandalous hypocrisy, when he said, "The Religious Right turns out to be the people the Religious Right warned us about." A practicing Episcopalian, Buttigieg is not the only candidate who attends Church, but he seems to be the one who speaks most explicitly and with apparent fluency about Church and why Church matters. If older, established generations of politicians have settled into certain patterns of pigeon-holing religious faith and practice, one of the potential advantages of generational newness may be the ability to escape that tired-out, pre-packaged approach. That tired-out, old, and hopefully increasingly descredited approach was reflected in Hillary Clinton's failed 2016 campaign. Despite being a lifelong, devout Methodist, Hillary Clinton proved unable to project her religious faith and its commitments in the context of her campaign. After Clinton's defeat, The New York Times' Amy Chozick (“Hillary Clinton’s Expectations, and Her Ultimate Campaign Missteps,” November 9, 2016) recounted how a year earlier supporters had invited her to address a prestigious Saint Patrick's Day event at Notre Dame University, the sort of event which Bill Clinton was eager for Hillary to do. But her campaign declined the invitation on the theory "that white Catholics were not the audience she needed to spend time reaching out to." Imagine if instead she had spoken at that event! Imagine if she had used the occasion to talk about her own Methodist faith and commitments and made a connection with the substantive social teachings of the Catholic Church (about which admittedly many American Catholics have heard hardly a word) and the magisterium of Pope Francis! The crowd scene in this Sunday’s Gospel [John 8:1-11] recalls so many such scenes of mob violence and vigilante justice in many places and at many times. For example, it reminds me of what happened in certain places in Europe at the end of World War II, when mobs of people, just recently liberated from German occupation, took revenge on those who had collaborated with the enemy – in particular, women who had gotten involved with German soldiers. As often happens in such situations, however, sometimes it was actually personal or business rivalries or other old scores that were being settled in the guise of post-war revenge. In this case, the mob’s motives for trying to involve Jesus are unclear, but the story suggests that it was an attempt to trap Jesus in some way. Was the mob trying to get Jesus to render a judgment without first giving the accused the hearing the Law entitled her to? Things like that happen, of course, all too often in human relations, especially in our scandal-driven, social-media age, when snap judgments are made immediately, while the real facts and complete context come later (if at all). Had Jesus gone along with judging her case without the hearing that the Law entitled her to have, then presumably Jesus would have been exposed in the process as something less than the prophet he was purported to be. Of course, Jesus saw through all of this. Instead of playing the mob’s game, he himself cleverly took control of the situation – by silently writing on the ground with his finger. The power of silence! What a lesson for our noisy, opinion-driven, chattering society! And what better way to silence problem people in any time or place than to appear to ignore them? What is more annoying to someone sputtering hateful tweets or otherwise trying to command one’s undivided attention than deliberately doing something else? Look at the wonderful example set several weeks ago by New Zealand’s Prime Minister's refusal ever even to say the name of the terrorist who massacred more than 50 people in a Christchurch mosque! Jesus’ silence must have been exasperating to the mob, as it probably would be to any one of us too. Just think how frustrating it can be for any one of us when we have to interrupt our ordinary daily activities to try to get an answer out of someone but instead have to wait endlessly to obnoxious music or repeated announcements about how important our call is to them, when it obviously isn’t! Jesus’ technique was effective. But even more effectively, when Jesus finally did say something, he totally turned the case completely around. The Law assigned the initiative in executing the sentence to the witnesses, but Jesus’ response forced them to judge themselves instead – in other words, to examine their own lives and to see themselves as God sees them. The result was quite dramatic, as they went away one by one, beginning with the elders. Now it was the woman’s turn to wait, while her accusers slowly drifted away as Jesus continued to write on the ground. As Saint Augustine famously summarized the silent drama of the scene: only two were left, misery and mercy. Finally, the silence ended. Jesus said to her: “Go, and from now on do not sin any more.” Like last week’s wonderful parable of the father and his two sons, this story is a dramatic demonstration of God’s way of dealing with us, so different from the way we deal with one another – and of what God really wants and expects from us in return. When we honestly examine ourselves without excuses or evasions, when we look directly into our own lives and the depths of our own hearts, and so begin to see ourselves as God sees us, as sinners truly forgiven and invited to reconciliation, then - out of that overflowing experience of forgiveness received - real reconciliation with one another becomes an authentic possibility. More than a mere possibility, it becomes an imperative – for our own healing and for that of our wounded world. Homily for the 5th Sunday of Lent, Immaculate Conception Church, Knoxville, TN, April 7, 2019. Signed by Pope Francis during an Annunciation Day visit to the Holy House of Loretto and released on April 2, the Pope's nearly 33,000-word apostolic exhortation Christus Vivit ("Christ is alive") is his response to the Synod of Bishops that met from October 3 to 28, 2018, to focus on the needs of young people today, It was Pope Francis' third synod - following two synods on family, and a subsequent 2016 apostolic exhortation Amoris Laetitia ("The Joy of Love"). 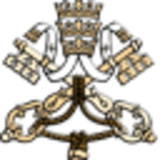 The synod process was initiated by Pope Saint Paul VI following the Second Vatican Council. Before this latest synod, the Vatican hosted two meetings with young people in late 2017 and early 2018. After the 4-week synod itself in October, the synod released a text that reflected the intense discussions among the participating 267 prelates and 72 lay auditors. All of the 167 paragraphs of that document were adopted by the synod with the required two-thirds vote. As has become standard custom, having received the synod's own report, the Pope now interprets and applies the synod's experience in an Apostolic Exhortation, which as Francis acknowledges at the outset deals with "those proposals i considered most significant" (paragraph 3). The Exhortation at times addresses young people principally and at other times speaks more generally to the entire Church. Its first two chapters reflect on stories of young people in the bible - Joseph, Gideon, Samuel, David, Solomon, Ruth, and on Jesus himself, who "gave his life when he was, in today's terms, a young adult" (23). At the same time, he reminds young people "that profound respect be shown to the elderly, since they have a wealth of experience" (16).This is an important theme to which he returns later in the document, when he warns against "a false cult of youth that can be used to seduce and manipulate young people" (180), telling them "to ignore their history, to reject the experiences of their elders, to look down on the past" (181). In contrast, God's word "encourages us to remain close to the elderly, so that we can benefit from their experience" (188), and to be "open to receiving a wisdom passed down from generation to generation, a wisdom familiar with human weakness and not deserving to vanish before the novelties of consumer society and the market" (190). After this, Francis moves on the the Church, which "should not be excessively caught up in herself but instead, and above all, reflect Jesus Christ. This means humbly acknowledging that some things concretely need to change, and if that is to happen, she needs to appreciate the vision but also the criticisms of young people" (39). "Rather than beign too concerned with communicating a great deal of doctrine, let us first try to awaken and consolidate the great experiences that sustain the Christian life" (212). The Pope challenges parents pastors and others who guide the young to "discern pathways where others pm;y see walls, to recognize potential where others see only peril" (67) There are, of course, real perils, some of which the Pope focuses on in chapter 3. Among them is the "ideological colonization" by "Western views of sexuality, marriage, life or social justice" and by "advertising" which "contributes to the throwaway culture" (78).One area singled out by the Synod on which the Pope elaborates in some detail is the digital environment - "living in a highly digitalized culture that has profound impact on ideas of time and space, on our self-understanding, our understanding of others and the world, and our ability to communicate, learn, be informed and enter into relationship with others" (86, referencing the Synod's Final Document, 21). Another area singled out by the Synod on which the Pope unsurprisingly elaborates in some detail is migration: In some host countries, migration causes fear and alarm, often fomented and exploited for political ends. this can lead to a xenophobic mentality, as people close in on themselves, and this needs to be addressed decisively" (92, referencing the Synod's Final Document, 26). The Pope then addresses young people directly in a very conversational style, not frequently found in such magisterial documents.. He starts with "three great truths." the first of which is that God loves you." He says "what I can tell you, with absolute certainty, is that you can find security in the embrace of your heavenly Father, of the God who first gave you life and continues to give it to you ate every moment" (113). His "second great truth is that Christ, our of love for you, sacrificed himself completely in order to save you" (118). "No one can strip us of the dignity bestowed upon us by this boundless and unfailing love" (119, referencing Evangelii Gaudium, 3). The third truth is the title of this Exhortation "Christ is alive!" Alive, Christ "can be present in your life at every moment, to fill it with light and to take away all sorrow and solitude. ... Because he did not only come in the past, but he comes to you today and every day, inviting you to set out towards ever new horizons"" (125). What might be called the Pope's most folksy advice to young people comes in chapter 5. where he says things like: "Dear young people, make the most of these years of your youth. Don’t observe life from a balcony. Don’t confuse happiness with an armchair, or live your life behind a screen. Whatever you do, do not become the sorry sight of an abandoned vehicle! Don’t be parked cars, but dream freely and make good decisions. Take risks, even if it means making mistakes. Don’t go through life anaesthetized or approach the world like tourists. Make a ruckus! Cast out the fears that paralyze you, so that you don’t become young mummies. Live! Give yourselves over to the best of life! Open the door of the cage, go out and fly! Please, don’t take early retirement" (143). That same chapter also speaks movingly about the importance of friendship: "Friendship is one of life’s gifts and a grace from God. Through our friends, the Lord refines us and leads us to maturity. Faithful friends, who stand at our side in times of difficulty, are also a reflection of the Lord’s love, his gentle and consoling presence in our lives. The experience of friendship teaches us to be open, understanding and caring towards others, to come out of our own comfortable isolation and to share our lives with others. For this reason, 'there is nothing so precious as a faithful friend' (Sir 6:15)" (151)..
Chapter 5 also offers an important and useful clarification about the nature of the lay vocation: "At times, seeing a world so full of violence and selfishness, young people can be tempted to withdraw into small groups, shunning the challenges and issues posed by life in society and in the larger world. They may feel that they are experiencing fraternity and love, but their small group may in fact become nothing other than an extension of their own ego. This is even more serious if they think of the lay vocation simply as a form of service inside the Church: serving as lectors, acolytes, catechists, and so forth. They forget that the lay vocation is directed above all to charity within the family and to social and political charity. It is a concrete and faith-based commitment to the building of a new society. It involves living in the midst of society and the world in order to bring the Gospel everywhere, to work for the growth of peace, harmony, justice, human rights and mercy, and thus for the extension of God’s kingdom in this world" (168). This chapter also offers a quotable quote from the 20th-century Chilean Jesuit Saint Alberto Hurtado (1901-1952): “being an apostle does not mean wearing a lapel pin; it is not about speaking about the truth but living it, embodying it, being transformed in Christ. Being an apostle does not mean carrying a torch in hand, possessing the light, but being that light… The Gospel, more than a lesson, is an example. A message that becomes a life fully lived” (175). The final chapters deal with Youth Ministry (already alluded to above), Vocation, and Discernment. Confronting contrary contemporary trends, Francis stresses the value of a vocation to family life. "It is true that the difficulties they experience in their own family can lead many young people to ask whether it is worthwhile to start a new family, to be faithful, to be generous. I can tell you that it certainly is. It is worth your every effort to invest in the family; there you will find the best incentives to mature and the greatest joys to experience and share. Don’t let yourselves be robbed of a great love. Don’t let yourselves be led astray by those who propose a life of rampant individualism that in the end leads to isolation and the worst sort of loneliness. … I have great confidence in you, and for this very reason, I urge you to opt for marriage" (263-264). And also to embrace work, which "is an expression of human dignity, a path of development and of social inclusion. It is a constant stimulus to grow in responsibility and creativity, a protection against the tendency towards individualism and personal gratification. At the same time, it is an opportunity to give glory to God by developing one’s abilities" (271). The Exhortation fittingly concludes with a discussion of discernment. “So often in life, we waste time asking ourselves: ‘Who am I?’ You can keep asking, ‘Who am I?’ for the rest of your lives. But the real question is: ‘For whom am I?’” (286, referencing the Pope's address in preparation for the 2017 World Youth Day). As is so often unfortunately increasingly the case with such magisterial documents, the Exhortation is long and wordy. The few young people likely to read it at all may wonder whether to persevere to the end. This leaves it to those whose role in the Church includes reading and studying such magisterial pronouncements to assimilate and internalize the spirit of this Exhortation in their ministerial outreach, including preaching and teaching. the pontiff offers few insights for what exactly must change or how the church can go about responding to young people who find its teachings or structures outdated. Likewise, while the new document notes that the Synod expressed a concern that the church's teachings on sexual identity and orientation are a "cause of incomprehension" for some young people, it does not reference the meeting's call for the church to undertake a deeper theological and anthropological study on such matters. Then, making one of the letter's 56 references to the Synod's final document, the pope acknowledges that the meeting said "a substantial number of young people … do not ask the Church for anything because they do not see her as significant for their lives." Francis says some young people want a church that "listens more, that does more than simply condemn the world." "To be credible to young people, there are times when [the church] needs to regain her humility and simply listen, recognizing that what others have to say can provide some light to help her better understand the Gospel," he states. Francis spends the last third of his new exhortation offering long reflections on the shape and scope of the church's youth ministry and on advising young people on how to discern their vocation in life. Opening his reflections on how a young person can go about identifying his or her vocation, the pontiff says that a person's calling from God is not only about the work that they will do. "Your vocation is something more: it is a path guiding your many efforts and actions towards service to others," the pope advises. "So in discerning your vocation, it is important to determine if you see in yourself the abilities needed to perform that specific service to society." "This gives greater value to everything you do," he says. "Your work stops being just about making money, keeping busy or pleasing others. It becomes your vocation because you are called to it; it is something more than merely a pragmatic decision." Francis exhorts young people to make the best of their youth, and to be unafraid of taking risks or making mistakes. "Don’t observe life from a balcony," the pope advises. "Don’t confuse happiness with an armchair, or live your life behind a screen." "Whatever you do, do not become the sorry sight of an abandoned vehicle!" says Francis. "Don’t be parked cars, but dream freely and make good decisions." Schools are the beating heart of neighborhoods, of the multi-generational communities that nurture families and enrich society. Perhaps the most successful social accomplishment of the Catholic Church in the United States has been the parochial school system, which educated generations of immigrant families and helped create a successful American middle class. That need still exists, of course, for newer generations of immigrants, but sadly there are fewer and fewer schools around to meet that need. It always saddens me to hear of a school closing. But I was especially saddened when it was announced the school I myself once attended will close this year. 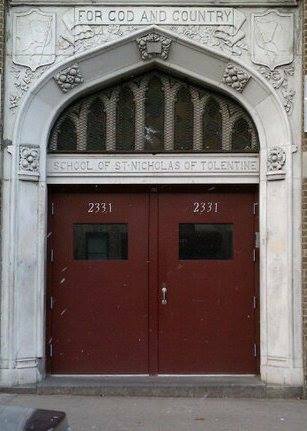 Saint Nicholas of Tolentine Parish Elementary School has served its Bronx, NY, neighborhood since it opened (with 90 students) in 1907 . When I graduated 8th grade in 1961, Tolentine (as it was commonly called) had some 1400 students. After 112 years, it will close at end of the current school year this coming June. The Saint Nicholas of Tolentine Parish and School Facebook site fittingly describes itself as "A place to share the memories of the great place we either grew up in or went to school at or worshipped at and the friends and people we found along the way." I was fortunate to do all three – to grow up, go to school, and worship there. And what a sight it was in those days, Sunday after Sunday, as thousands of people poured out of the 13 Sunday Masses celebrated in both upper and lower churches! (Sunday Masses upstairs at 6, 7, 8, 9, 10, 11, 12, and 12:50 and downstairs at 9, 10:15, 11:15, 12:10, and 12:55.) In fact, almost everything about that great Gothic church - referred to by some as "the cathedral of the Bronx" – was impressive. Closing the celebration of the parish's 50th anniversary on September 10, 1957, no less a luminary than New York's Francis Cardinal Spellman himself said, "Very few cities in the United Sates have cathedrals which have the beauty of your parish church." It was a distinction the neighborhood took pride in. In post-war Catholic New York, parish and neighborhood were often largely one and the same. Of course, people left their neighborhoods to work elsewhere in the city, and the wider world's influence was certainly felt within those communities. But, at least when I was growing up, most of our day-to-day needs, both social and spiritual seemed to be met there in the parish. Such neighborhoods were overwhelmingly hard-working blue-collar, working class communities – at a time when strong unions and the general post-war prosperity instilled the forward-looking optimism that goes with a sense of collective upward mobility, all of which our society has sadly since lost. The parish school was an old, early 20th-century building, barely able to accommodate the 1400 or so students enrolled in it. In winter, the heat sometimes didn’t work, and we would sit in class with our coats on. Such privations probably would seem unacceptable to many people today, but then they seemed perfectly normal, completely coherent with how we lived – in apartment buildings where likewise the heat also didn’t always work in winter! Surely teaching 50+ kids five days each week had to be a real challenge. Some of my teachers, my 8th grade teacher, for example, were quite experienced. For my 5th grade teacher, on the other hand, we were her first class. The amazing thing, I think, about the parochial school system in those days was that it all somehow managed to work – and, on balance, really worked quite well. Again, what made it all work so well was that it was coherent with the rest of our world. Adults at that time largely supported the school, valued the Sisters, and almost always sided (if that is the right word) with them. It was a world of clearly defined moral rules and social expectations. Not everyone benefited equally from those rules and expectations. But, for many at that time, the burdens seemed bearable and paid off as guideposts toward a reasonably predictable and stable way of life. In the half-century and more that followed, enormous economic and cultural changes have eviscerated the opportunities available for working class people with modest educational background and have radically diminished their prospects for financial and social stability in successfully functioning families. Social change always has winners and losers, and 21st-century America has paid a price for the alienation those losses produced. Back then, parochial schools were, as I said, fairly basic. We had no kindergarten, just 8 grades. In the fall of 1954, I started 1st grade at Tolentine. I had laywomen as teachers in grades 1, 3, and 4, and Blauvelt Dominican Sisters in all the other grades. School was so crowded at what was then the height of the "Baby Boom," that classes were half-day sessions through grade 5. By then the new parish high school had been built, and the old high school building became part of the elementary school, increasing the amount of classroom space available. Obviously we lacked the educational benefits of contemporary technology, but beyond that we suffered no noticeable academic disadvantage from such large classes, and may well have been better educated in certain respects than some are today. Side by side with an all-encompassing, seemingly “otherworldly” spirituality, we received a rudimentary appreciation of art and music, learned practical skills like the right way to write a “friendly letter” and a “business letter,” and studied civics and were taught to take seriously the responsibilities of citizenship. Midway through 3rd grade, I was “skipped” to the middle of the 4th grade. Having students “skip” a grade was also, I suspect, one more way of dealing with the then widespread overcrowding! I most certainly did not want to “skip.” Being wrenched out of my class and dropped down into another one was certainly destabilizing. And it meant dropping me into the middle of a grade the first half of which I had already missed. In particular, what I had missed that year was long division – something I struggled with for quite some time. I cried a lot that spring, struggling with my long-division homework! Long-division aside, I liked most of what we studied. Some subjects were new in 4th grade – history and geography, for example. Some subjects – history again and religion – I especially enjoyed. Each September, when school resumed and we got our new textbooks, I rushed to read through the entire history book as quickly as possible, so eager was I to learn, so in love was I with other times, other places, and other possibilities. Needless to say, in parochial school in the 1950s, it was religion that permeated every day of the school year and every subject of study. We prayed at the beginning and the end of the day (and before and after lunch). We recited the Morning Offering in the morning, the Angelus at mid-day, various other prayers throughout the course of the school day, and an Act of Contrition at day’s end. Whenever a priest came into the classroom to speak to us or to our teacher, before he departed we would reverently request his priestly blessing. Then we would all (including Sister) dutifully drop to our knees while Father raised his hands in a semicircle and then made the sign of the cross over us, saying Benedicat vos omnipotens Deus, Pater, et Filius, et Spiritus Sanctus. Meanwhile, from celebrating Our Lady’s birthday in September, to the daily Rosary in October, decorating the crib at Christmas, and making the Stations of the Cross in Lent, all the way to Mary’s annual May Crowning at the end of that month, the calendar followed a set cycle of taken-for-granted devotions that punctuated the year and marked the recurring rhythm of months and seasons. And, of course, there were the special life-cycle celebrations, such as First Confessions, First Communion, and Confirmation, for which the school faithfully prepared us. On Saturday, June 4, 1955, at an 8:00 a.m. Solemn High Mass, having now officially reached the “age of reason,” I made my First Communion - after having made my First Confession the day before. What I actually remember most about my First Communion was how much time we spent practicing beforehand. The Sisters were not about to leave anything to chance! The other significant life-cycle sacrament was, of course, Confirmation, which I received in the 5th grade on Sunday, September 22, 1957. The Bishop was a Dutch Augustinian, Peter Canisius van Lierde (1907-1995), who held the exalted post of sacristan to Pope Pius XII. As for the ceremony itself, I was most invested in the confirmation name I had chosen. I remember carrying a card between my fingers with my name on it. I remember a priest then taking the card and saying the name to the Bishop (in what I later would learn was the nominative case) and then the Bishop addressing me (in what I later would learn was the vocative case): Michaele, Signo te signo crucis; et confirmo te chrismate salutis. In nomine Patris, et Filii, et Spiritus Sancti. Much more important, however, was becoming an altar boy. In those days, it was considered a great privilege (albeit a common one) to serve Mass. I eagerly joined my classmates to the rectory chapel where we practiced the complex maneuvers of moving the missal from the epistle side of the altar to the gospel side and then back again, carrying (and kissing) the cruets with the wine and water, ringing the bells, walking with the priest at the altar rail and carrying the communion plate, and so much more. 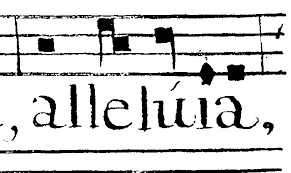 And, of course, there was the Confiteor and all the other Latin responses to memorize, starting with the psalm response at the foot of the altar: Ad Deum qui laetificat juventutem meam! As I remarked at the time of my 50th High School reunion, we became judges and lawyers, policemen and priests, teachers and truck-drivers. The school did its job and did it very well. And it will be missed, for that work is still very much needed today!